SPIDER-MAN’S SCREWIEST SPIDER-VERSES #1: Rick Geary’s Spider-Man! Home » COMICS HISTORY » SPIDER-MAN’S SCREWIEST SPIDER-VERSES #1: Rick Geary’s Spider-Man! What is this SPIDER-VERSE of which you speak, Marvel? Bah! John DiBello‘s got you beat! Spider-Man, much like Elvis, is everywhere. That’s the concept behind Marvel’s SPIDER-VERSE event, teaming up every version of Spider-Man that ever existed, everywhere, every-when. That includes alternate realities, “What If”s, past and future Spider-Men, variant-costumed Spideys, etc. Just this week, we have Edge of Spider-Verse #1: Spider-Man Noir. Maybe, if we’re lucky, we’ll get the early Jack Kirby concept for Spider-Man — the guy who carried a web gun. I hope they include the version where Aunt May got bitten by the spider from What If? #23. Whatever his best intentions, writer Dan Slott can’t include an infinite number of web-slingers, so 13th Dimension will gallantly pick up the slack and introduce you to SPIDER-MAN’S SCREWIEST SPIDER-VERSES, a recurring series running between now and whenever Marvel wraps up this Spider-Madness — kicking off with Rick Geary’s Spider-Man! 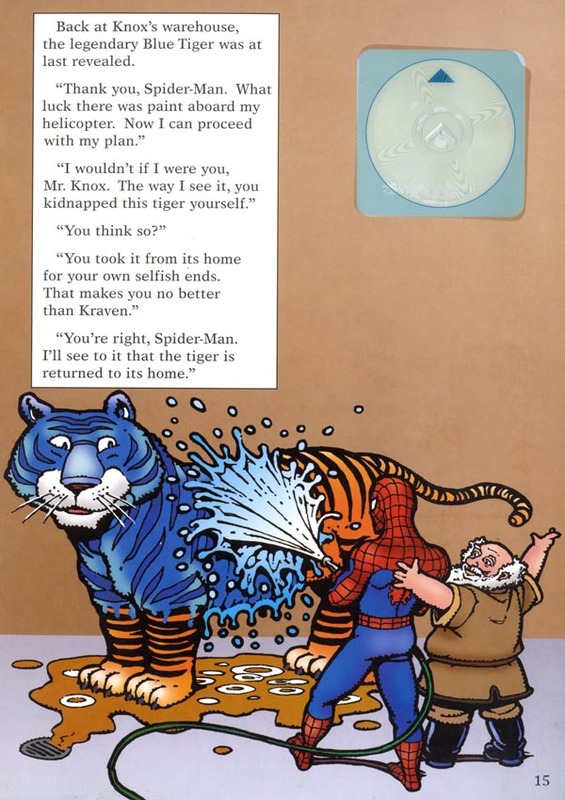 Don’t go shuffling through your longboxes of Amazing Spider-Man (or Spectacular, Web of, Sensational, Friendly Neighborhood, and Adjectiveless) searching for a comic drawn by alt-comics maestro Geary: His only work on Spidey is in a children’s book: Chase for the Blue Tiger. Geary, winner of the National Cartoonist Society Magazine and Book Illustration Award, has a distinctive and delightful style, and he’s done much more alternative comics and illustration work than mainstream superhero, writing and drawing stories in Heavy Metal, National Lampoon, Epic Illustrated, and Dark Horse Presents (and its Euro-cousin, Cheval Noir). He’s perhaps best known for his series A Treasury of Victorian Murder. 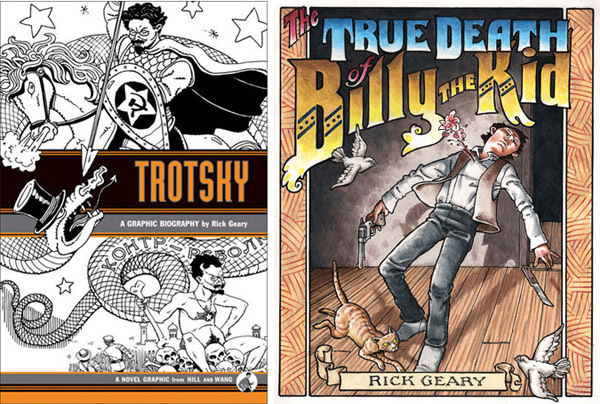 He’s created graphic novel biographies of famous historical persons (including the upcoming, Kickstarter-funded The True Death of Billy the Kid). 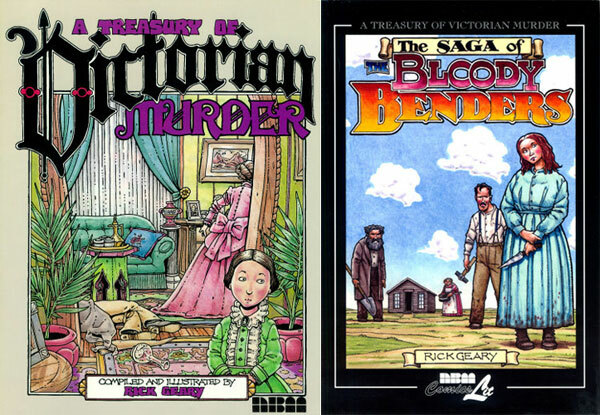 Geary’s affinity for the Victorian Age is evident in his Classics Illustrated books for First Comics in the 1990s. He adapted Wuthering Heights, The Invisible Man, and — shown here — Great Expectations. 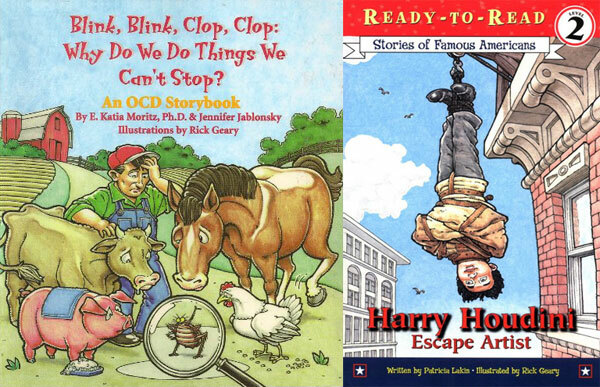 …and he’s done a series of kid-friendly storybooks based on The Mask for Dark Horse. 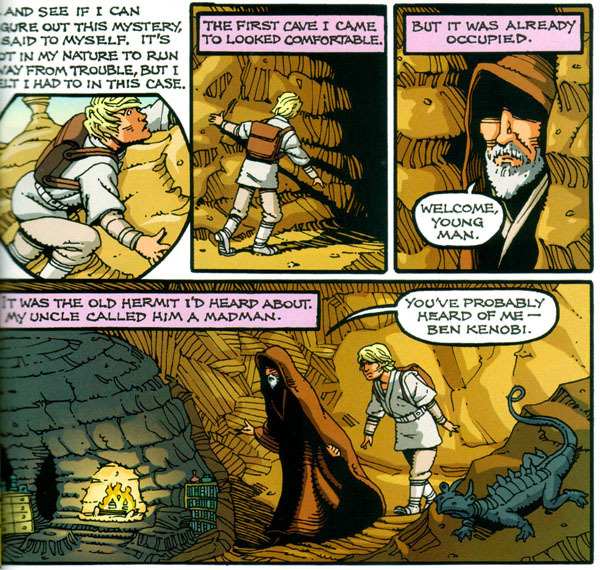 …and Dark Horse’s Star Wars series. 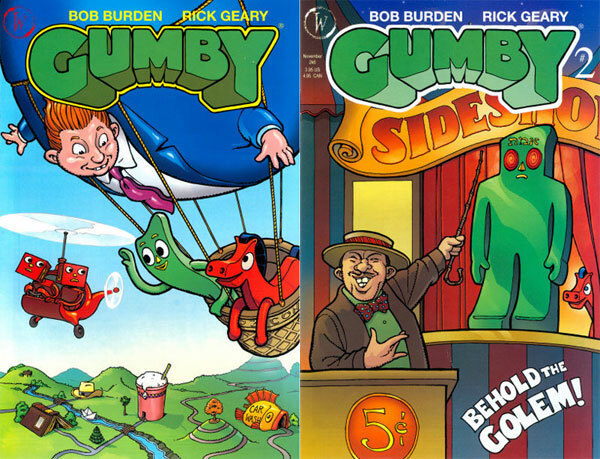 My favorite Geary-illustrated comic books are the delightfully silly and fun Gumby one-shots written by Bob Burden (Flaming Carrot). Geary’s Spider-Man tale begins as do so many adventures in the chronicles of Peter Parker: being chewed out by J. Jonah Jameson. Hey, look at the background character: that idiosyncratic cornrow hairstyle can only belong to one man: Spidey’s perpetual nemesis Norman Osborn, the Green Goblin! And what is that weird silver disc in the middle of the page? Why, that’s the Comes to Life StoryDisc! There’s one embedded in each spread of the book. 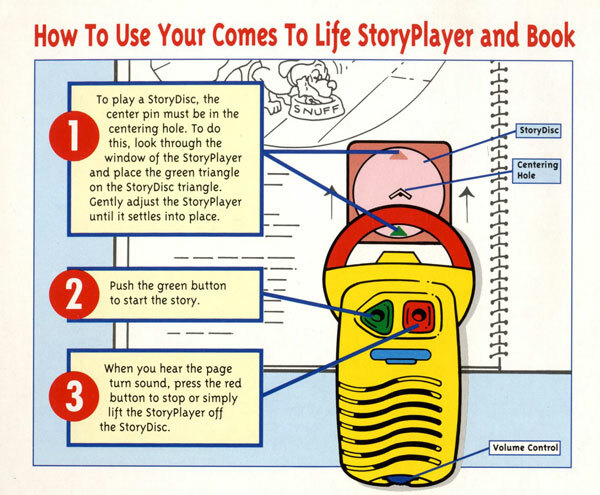 Like a tiny vinyl record, the StoryDisc reads the book aloud when it’s played by the sold-separately Comes To Life StoryPlayer! I’m sorry I don’t have a functional copy of this book, because there’s a full voice cast including Ed Asner! 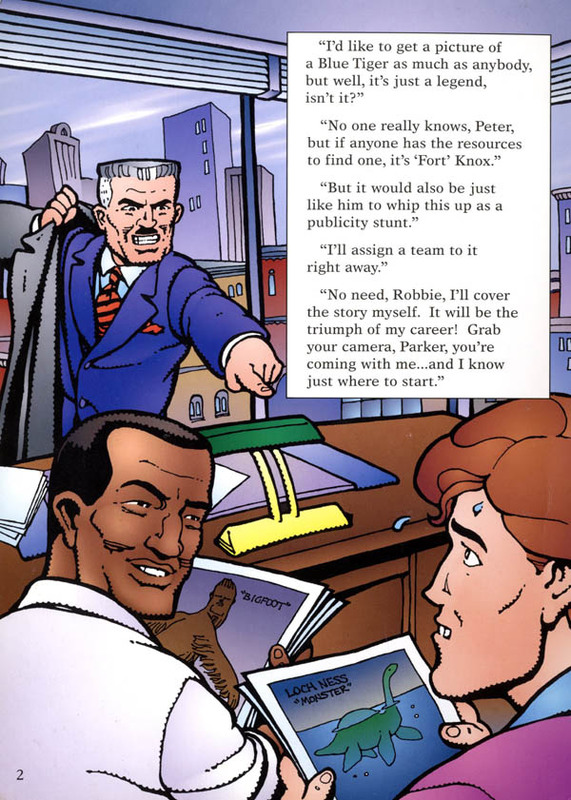 I certainly hope he played J. Jonah Jameson, thus adding yet another great portrayal of a newspaperman to his resumé. 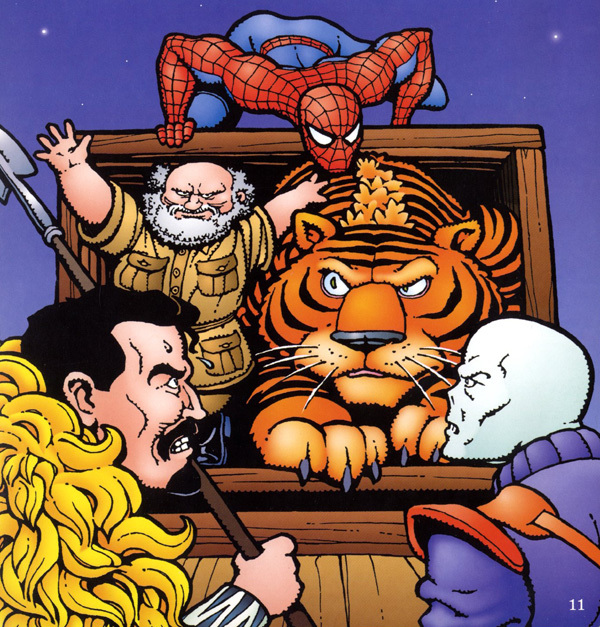 There were several Comes To Life books produced for the StoryPlayer in the 1990s, including media tie-ins for Teenage Mutant Ninja Turtles, The Berenstain Bears, Tiny Toons Adventures, Mickey Mouse, and of course, Geary’s Spider-Man book, which captures the look and personalities of the Spider-Man universe while rendering it in Geary’s unique style and keeping to the gentle tone of a children’s book. 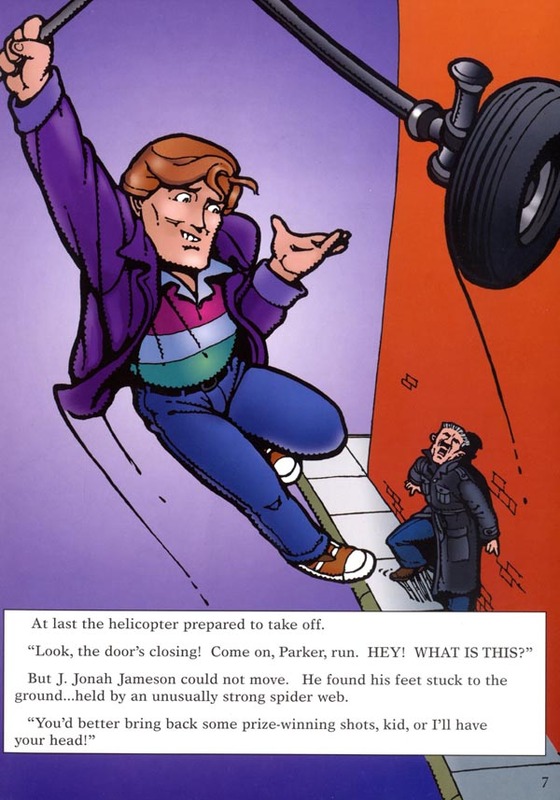 JJJ and Peter Parker track the mysterious Mr. Knox, and Pete takes advantage of the opportunity to follow Knox’s helicopter by himself, surreptitiously web-gluing Jameson’s shoes to the sidewalk. 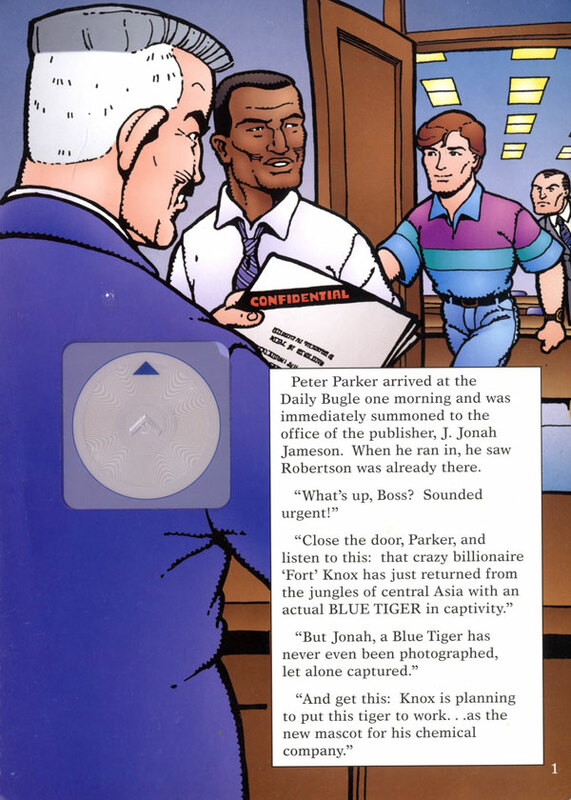 You don’t think that’s gonna be at all suspicious if Jonah figures out what he’s being held down with, do you, Spidey? 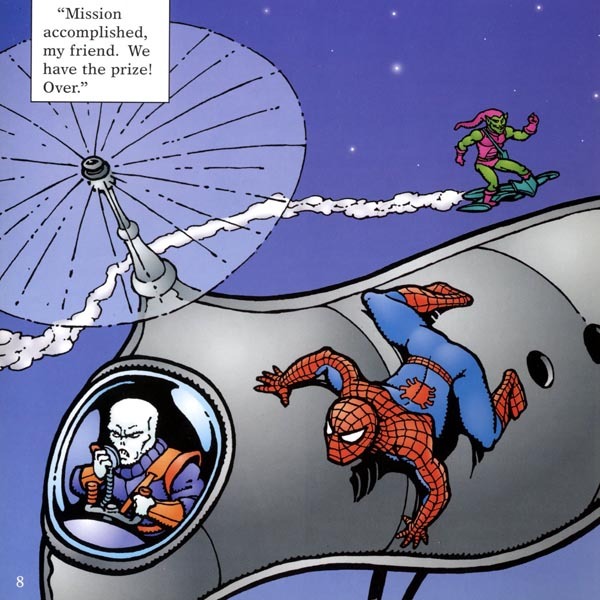 The helicopter is piloted by familiar Spider-Nemesis the Chameleon. And, if you look closely in the background, you might just spot another enemy — it’s the Green Goblin again, now in costume! 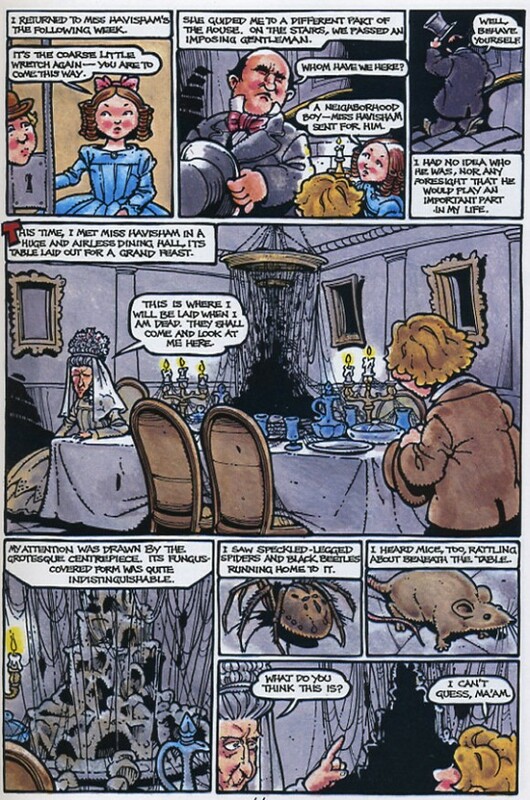 This is a wonderfully bizarre and brilliant touch by Rick Geary: the Goblin does not appear anyplace else in this story and is never mentioned in the text. 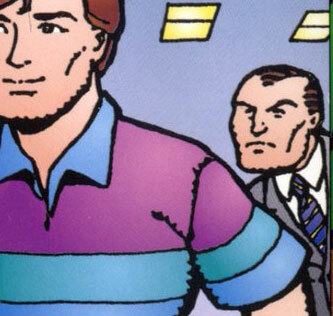 Was Geary setting up a storyline in which eventually the Green Goblin would be revealed as the mastermind of an entire series of Spider-Man StoryPlayer adventures? Sadly, since this book was the only Spidey story published in the series, we’ll never know. In fitting with a book for young children, there’s no actual hero-on-villain punching violence in the story, but Geary handles it neatly. 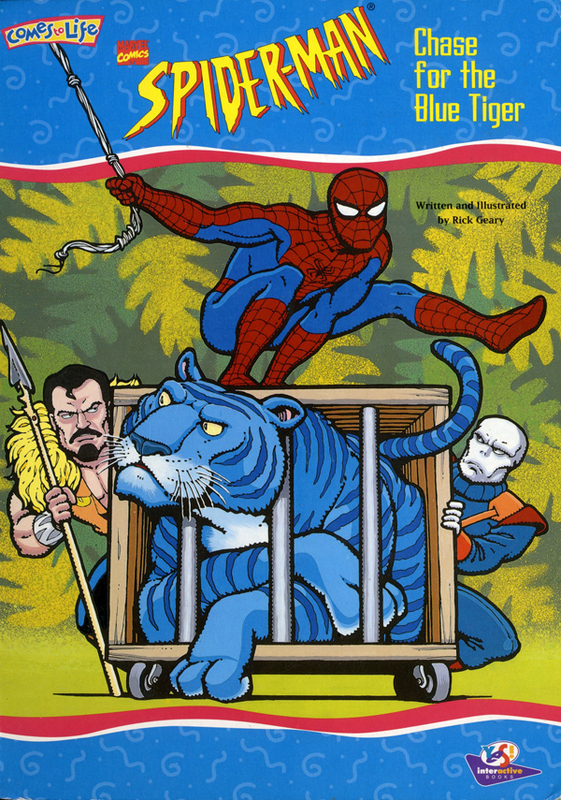 The titular Blue Tiger — an regular orange tiger painted blue leaps on and pins Chameleon and his cohort Kraven the Hunter, and the not-so-evil Knox mends his wicked ways. Rick Geary’s entry into the Marvel Comics universe is short but sweet, and while the story is for young kids, it’s clearly done by someone familiar with the Spider-Man Universe. 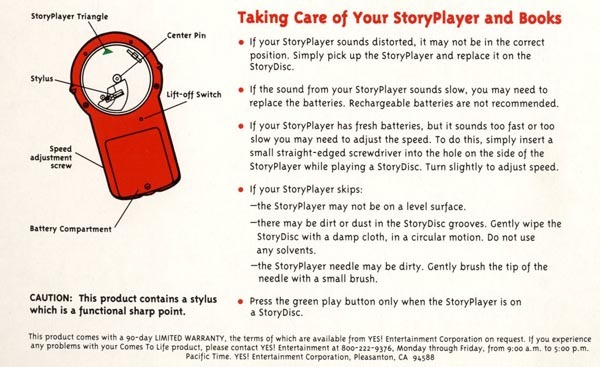 The Yes Corporation, makers of the StoryPlayer series, would soon find their innovation outpaced by sound chips embedded into books and the StoryDisc technology can now only be found on the shelves of thrift shops and garage sales. Unless, of course, you took proper care of your StoryPlayer and books by following the elaborate small print at the end of the book. Despite the presence of an actual tiger, the most dangerous thing in this whole book is the functional sharp point of the StoryPlayer stylus. Want to “read more about” Geary? Here’s Rick Geary’s website, including the extensive checklist of his work. Hey, he’s listed another Spider-Man kid’s book in his credits, “Spider-Man: Lights, Camera, Danger!” Two appearances of a Geary Spidey? 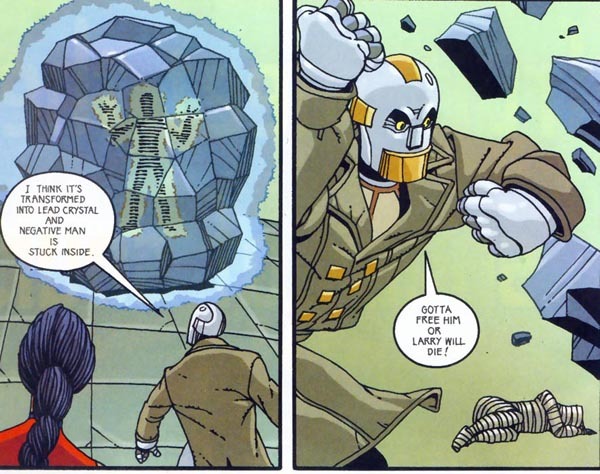 Why, surely that qualifies Rick Geary Spider-Man for a guest-shot in Spider-Verse. I’d welcome him, and his Blue Tiger, crossing over to the regular Marvel Universe! Wow! I love Rick Geary, have ever since I read his NUTS comic in National Lampoon (they were my father’s issues.) I think his style is well-suited to Spidey, he should draw a monthly!